GRAY — Following two bomb threats at Gray-New Gloucester Middle School in March, SAD 15 officials this week held a community forum to discuss district policies and practices related to school safety. “It’s not simply a response to the big scary things,” said Ferriter, emphasizing that day-to-day safety is a major component of the approach. Ferriter said that when he first came to the district three years ago, the emergency response plans hadn’t been updated in 15 years and he has worked to implement the four basic I Love U Guys protocols of lockdown, lockout, evacuate and shelter. Gray Fire Chief and Public Safety Director Kurt Elkanich addressed the audience of about 40 people to explain how different community partners, such as the fire rescue department and sheriff’s office, collaborate in the event of an incident or emergency. Dunn Elementary Principal Geoff Robbins gave an overview of safety within district schools and outlined what he called five tenets of school events and safety: discussing things withing district teams, training students to report suspicious behavior, developing well-defined emergency plans, communicating with parents and building personal relationships with students. Dr. Joe Fitzpatrick, a psychologist who consults for the district, discussed how to best support the emotional needs of students. Fitzpatrick emphasized that communication between the district, parents and students is critical. “It’s all about talking to you, talking to the kids, keeping you and the kids talking to each other,” he said. District Guidance Counselor Kate Genovese outlined existing resources within the district to support students who may need support or could be in crisis. “It’s really tailored to an as-needed basis,” she explained. The audience was made up mostly of parents, along with some SAD 15 staff and at least one member of the school board. During the Q & A portion of the forum, several parents expressed some level of frustration with the communication from the district during the recent bomb threats, when Middle School students were evacuated to the nearby High School and later sent home from there. The mother of a fifth-grade student said that one of the recent bomb threats was “a very scary event for me” and wondered if there were a way for the district to give out more key information during an event or emergency. Superintendent Craig King said he has worked to get information out as quickly and accurately as he can. “I’m not sending out to the parents misinformation (or) speculation,” King said, adding that it’s difficult to stay ahead of information shared on social media that may not always be correct. He said he had one update out approximately 27 minutes after one of the bomb threats. One mother urged the district to reconsider its policy against middle school students having cell phones on them at school, saying that responsible students should be trained about how and when to use their phones to update their parents in the event of an emergency. Ferriter said he understood the mother’s perspective, but cautioned that even responsible adults can spread misinformation in an emergency, and warned that a high volume of people using cell phones all at once could overburden the communications network. Ferriter also acknowledged that he added to some confusion during one of the recent bomb threats by mislabeling one of the safety protocols, which implied a threat from outside the school. “Absolutely, the burden of that misinformation is on my shoulders,” Ferriter said, while still emphasizing his concerns about controlling the flow of information and limiting misinformation and confusion. Another repeated concern from parents Tuesday night was that students might not be grasping the full consequences of actions like calling in a bomb threat. Several parents wondered what the school could do to make it clearer that calling in these threats would be treated as a criminal matter. “They need to know it’s a serious crime,” one parent emphasized. Ferriter said he is “just as frustrated when we have to evacuate one of these buildings for something as foolish as the word bomb written on a stall,” he said. “Unfortunately, so long as I am the school resource officer, that will always be the protocol we do, because I’m not willing to put any of your students at risk,” he continued. 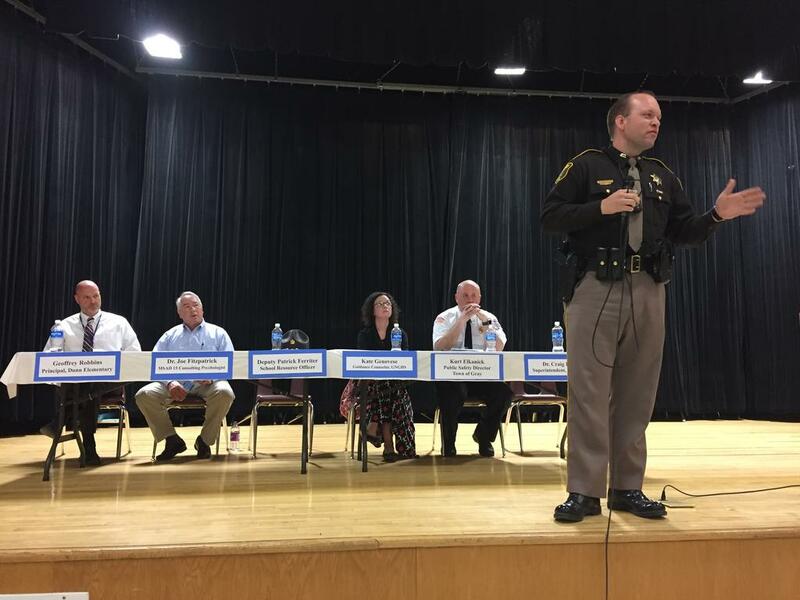 Cumberland County Sherrif’s Deputy Patrick Ferriter, the SAD 15 school resource officer, speaks during a school safety public forum Tuesday night. Other members of the panel seated behind him include (l. to r.) Dunn Elementary School Principal Geoff Robbins, psychologist Dr. Joe Fitzpatrick, Guidance Counselor Kate Genovese and Gray Fire Chief and Public Safety Director Kurt Elkanich.